DWT (3x Inverse/Short Crude Oil ETN) offers an objective long entry for a pullback trade on crude oil & will be added as an Active Short* Trade around current levels. 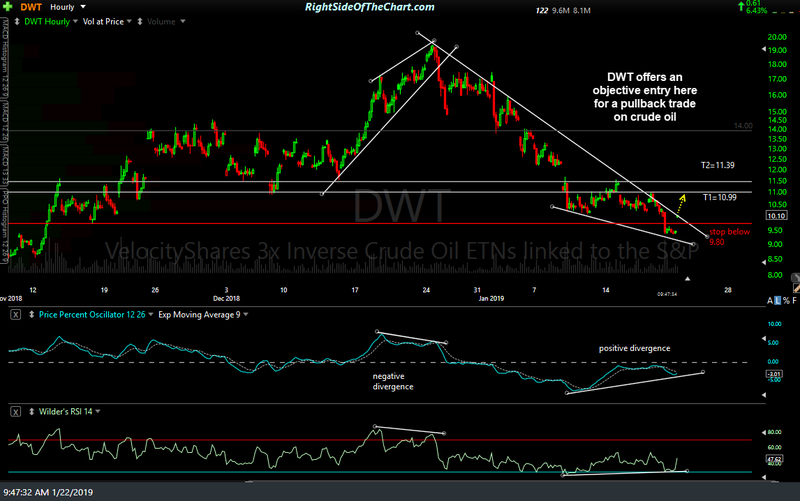 *As DWT is an inverse ETN, one would buy (i.e.- go long) DWT to short crude oil. The price targets are T1 at 10.99 & T2 at 11.39 with a suggested stop on any move below 9.80. The suggested beta-adjusted position size on this trade is 1.0, which is essentially a 3x position size equivalent to a short on USO (1x long crude ETF). The reasoning for the oversized position is based on my confidence in this trade, my expectation for a relatively quick pullback trade and the fact that the suggested stop is set less than 3% below current levels, resulting in a relatively small loss if the trade is stopped out. The basis for the trade is a breakdown below this 60-minute bearish rising wedge pattern that was posted in the trading room before the regular trading session opened today. I’ll post an updated chart in the comment section below as soon as I get a chance but wanted to get this trade posted & sent out asap). Thanks Randy, could you provide the equivalent USO levels? 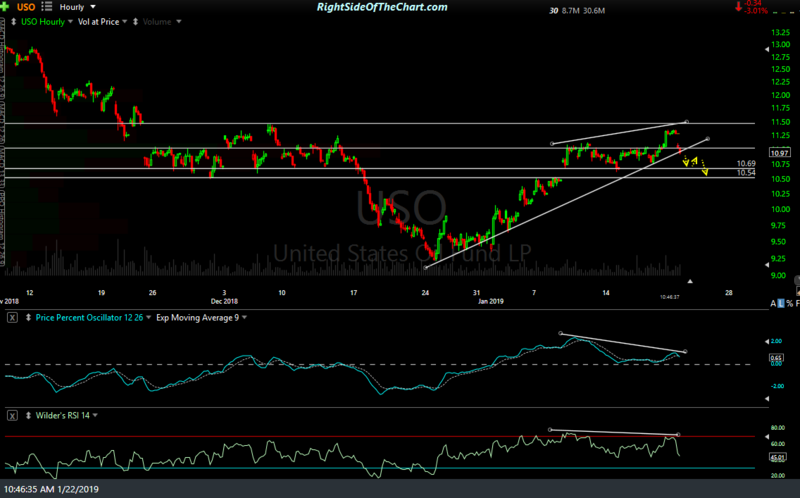 USO support levels (unadjusted price targets) are 10.69 & 10.54. G-luck! @rsotc since this has popped since the post was put out would you wait for a pullback to an objective level such as the bottom of that wedge around 10.20? Feels like chasing given that it’s up 9% already. Thanks. I don’t think that crude is going offer anyone another shot via a backtest but if by chance it does, yes, that would be an objective entry. Alright, thanks for the objective breakdown. 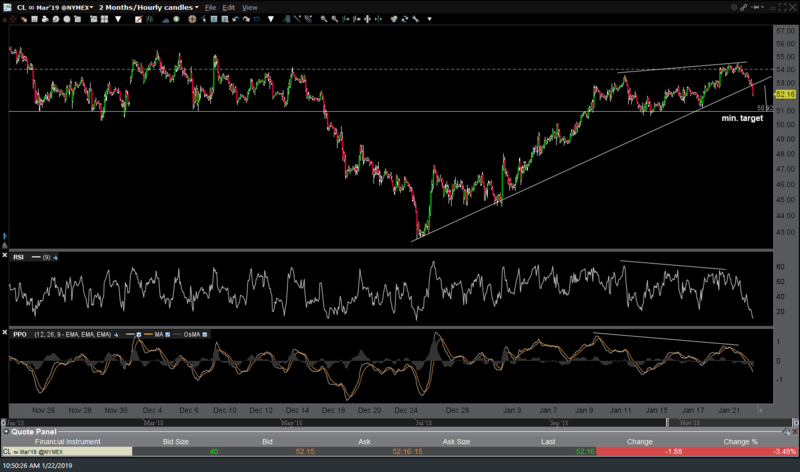 Agreed, that breakdown of crude was very impulsive. Still got a ways to fall without a lot of consolidation outside of that $51-52 range. I may just sit this one out and if we get the backtest then take it otherwise plenty of other opportunities. Yep, it did quite nicely. It actually blew through it and offered an even better objective entry with CL sandwiched between a bunch of EMAs on the hourly. I didn’t take it … in fact it broke down pretty impulsively when UWT/CL found some pretty crazy support and is bouncing HARD but this may yet offer another objective entry. Thank you Randy! A little late entry for me, but got in on the pull back to 52.63.